The age of Victorian romance flourishes again in this verdant gemstone ring from Apples of Gold. A single peridot stone breathes life into this piece with its lush, light green color. 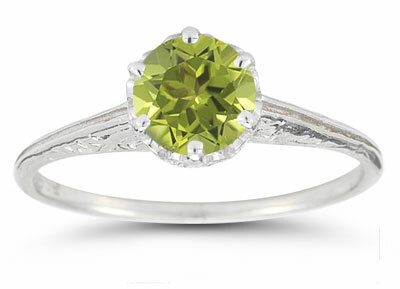 The peridot is round cut for a shimmering effect and secured by six 14K white gold prongs. A setting of white gold mounts the green stone above the band in splendid beauty, while the band below offers sweet engravings to round out this exquisite Victorian-style ring. We guarantee our Vintage Prong-Set Peridot Ring in 14K White Gold to be high quality, authentic jewelry, as described above.